This case study is set to analyze the brewing crisis in the Ferghana Valley in Central Asia. The focus will be on the growing water use conflicts arising in the valley and the effects on the mix of ethnic communities scattered throughout the valley, split strategically between countries borders created by Stalin. Turkestan Autonomous Soviet Socialist Republic was created from the Turkestan Krai of Imperial Russia. Its capital was Tashkent, population about 5,000,000. 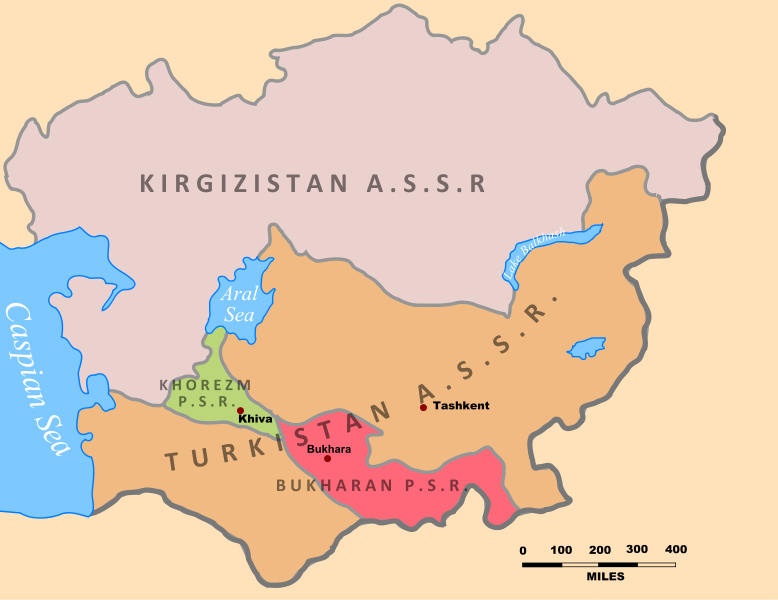 In 1924, Turkestan ASSR was partitioned into two Soviet Socialist Republics (SSR), Turkmen SSR and Uzbek SSR. Turkmen SSR matched the borders of today's Turkmenistan. 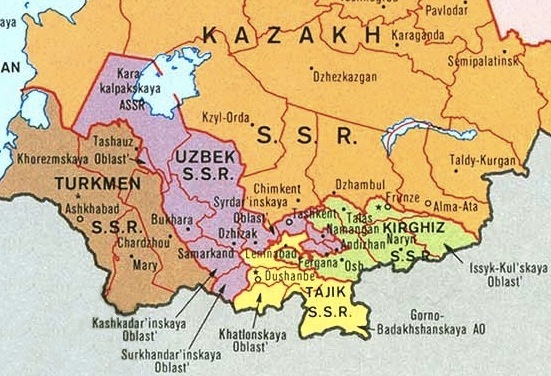 The Bukhara and Khorezm People's Soviet Republics were absorbed into Uzbek SSR, which also included other territories inhabited by Uzbeks as well as those inhabited by ethnic Tajiks. In 1929 the Tajik Soviet Socialist Republic (Tajik SSR) was created from the Uzbek SSR for the Tajik ethnic population. 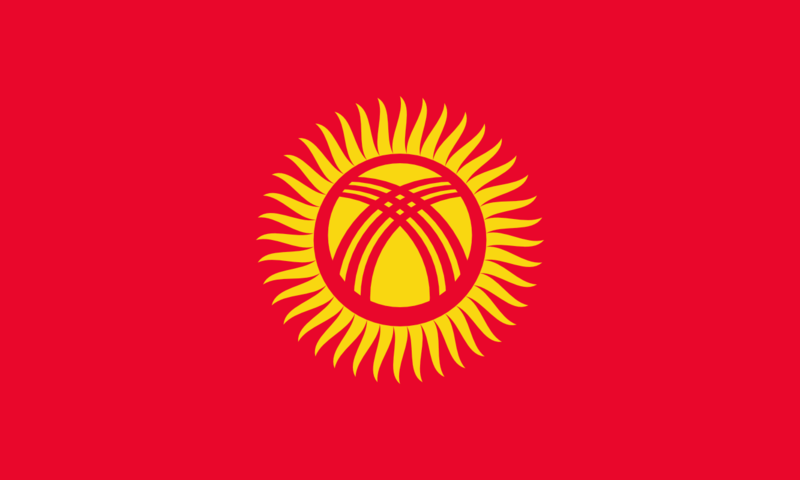 Kirghiz SSR (today's Kyrgyzstan) was created in 1936; upgraded to a Republic from the Kara-Kirghiz Autonomous Oblast. Kazakh SSR was also created at that time, December 1936. The valley straddles Uzbekistan, Kyrgyzstan and Tajikistan. The area remains Muslim, populated by ethnically Uzbek, Tajiks, and Kyrgyz, often intermixed and not matching modern borders. As well there are substantial populations of Russian, Kashgarians, Kipchaks, Bukharan Jews and Romani minorities. Nowhere else on earth are three countries so highly interdependent in terms of water and energy. Tajikistan, Kyrgyzstan and Uzbekistan share borders that have been rather artificially created during the Soviet Union era. These borders did not matter very much during Soviet times, but became actual international boarders with meaning after independence, giving rise to numerous cross-border conflict situations, especially around access and management of land and natural resources (in particular water). Infrastructure (such as roads, railways, irrigation systems, canals, water pipes, etc.) was often established without consideration for the borders, making their management extremely complex after independence. In some parts, the border cuts through villages and even backyards of houses. Roads meander repeatedly across borders. Water pump stations may be located on one side of the border to provide irrigation water to the other side. The collapse of the Soviet Union lead to a comprehensive change in the economic structure of the region. During Soviet times the major of the population in the Fergana valley worked on collective farms, which guaranteed a low but stable standard of living. However after the breakup and the rise of the independent countries the local populace has experienced an end to their relatively carefree life. In addition, the few industrial enterprises in the region have either closed down or are working at a substantially lower level. As the newly formed republics began to privatize state farms and carried out this program throughout the region, these private farms are now of utmost importance as they are now the only reliable sources of family income or at least subsistence farming. The agricultural activities in the valley, such as those that previously concentrating on cattle breeding, soon shifted to subsistence farming. The individual demand for irrigation water on small fields rose sharply. However, since hardly anybody paid for the provided resource the existing distribution systems, mainly consisting of open concrete canals, have fallen in disrepair or having even been taken apart and sold as scrap. The increased demand for water and energy resources have come to head with the fact that rainfall has been decreasing and temperatures have been increasing. The increasing need for irrigation water is conflicting with the increase demand for electrical production via dams as access to other fuel sources have demised with the collapse of the Soviet systems. 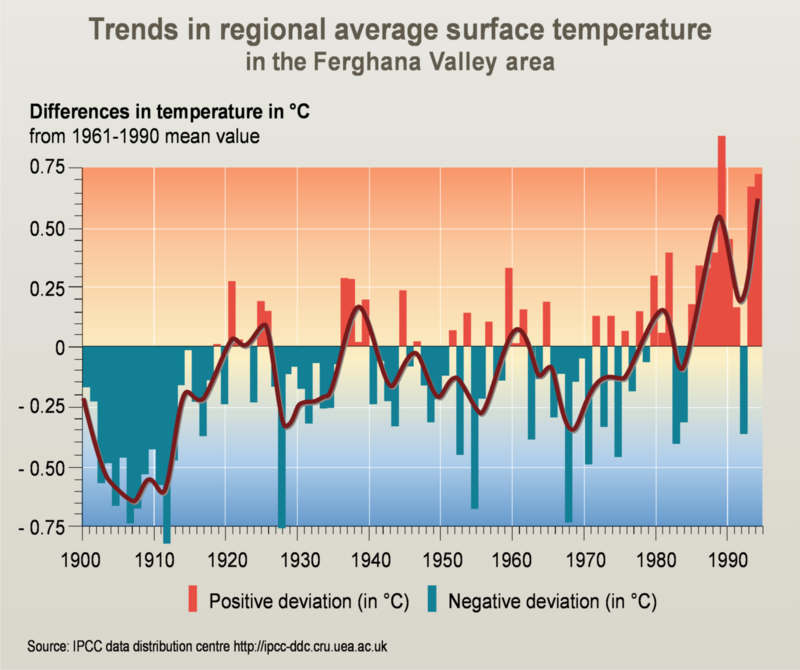 Trends in regional average surface temperature in the Ferghana Valley area. Source: Viktor Novikov, UNEP/GRID-Arendal. Trends in regional average surface temperature in the Ferghana Valley area. 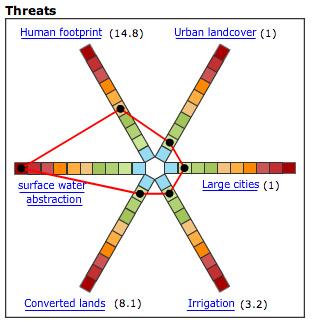 UNEP/GRID-Arendal Maps and Graphics Library. 2005. Over the past 30 years the average regional surface temparature in the Ferghana Valley region has increase significantly, on average about .5 degrees C.
This is an important factor when looking at the region in terms of environment and security is the impact of climate change in Central Asia in general, and Ferghana Valley in particular. In the Ferghana valley it is likely that climate change will primarily affect sector related to water and agriculture. Central Asia is likely to have a shortage of water associated with a significant increase in air surface temperatures. The Ferghana Valley is a region in Central Asia spreading across eastern Uzbekistan, Kyrgyzstan and Tajikistan. A large triangular valley in what is an often dry part of Central Asia, the Ferghana Valley is at the intersection of two rivers, the Naryn and the Kara Darya, which run from the east, joining near Namangan, forming the Syr Darya river. The borders, clearly visible in this map, of the three countries were artificially created during the Soviet Union era, stemming from Stalins objective of "divide and rule", which denied any one country from controlling all the resources in the valley. 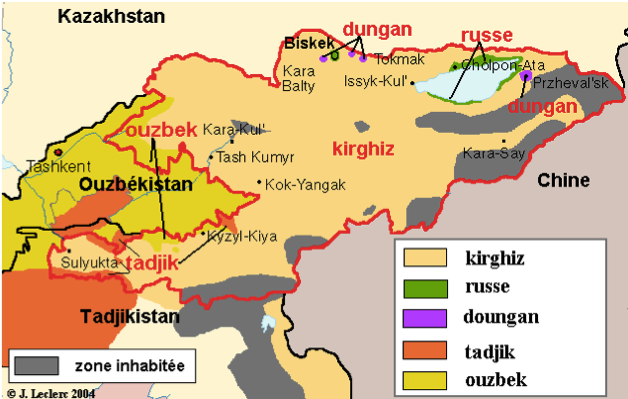 As a result, Tajikistan has a large Uzbek and a smaller Kyrgyz minority, Kyrgyzstan has Uzbek and Tajik minorities and Uzbekistan has a large Tajik and smaller Kyrgyz minority. In addition, between the three countries in the valley, there exists approximately 7 enclaves in the valley, in addition to causing confusion and ethnic tensions, these enclaves have been promoted by the respective governments as providing ideal safe havens for armed terrorist groups such as the Islamic Movement of Uzbekistan (IMU), who have launched a number of raids in the past, weaving in and out of Kyrgyz and Uzbek territory to evade capture. There is one exclave, the tiny village of Barak (population 627), in the Fergana Valley. The village is surrounded by Uzbek territory. It is located on the road from Osh (Kyrgyzstan) to Khodjaabad (Uzbekistan) about 2miles north-west from the Kyrgyz-Uzbek border in the direction of Andijan. There are four Uzbek enclaves within Kyrgyzstan. Two of them are the towns of Sokh (125 sq. miles with a population of 40k-70k; with 99% are Tajiks, the remainder Uzbeks) and Shakhimardan (35 sq. miles, population of 5,100; 91% are Uzbeks, the remainder Kyrgyz). The other two are the tiny territories of Chong-Kara (roughly 2 mi by 0.6 mi) and Jangy- ayyl. Chong-Kara is on the Sokh river, between the Uzbek border and the Sokh enclave. Jangy- ayyl is about 60 kilometres (37 mi) east of Batken, in a northward projection of the Kyrgyz-Uzbek border near Khalmion. There also are two enclaves belonging to Tajikistan within Kyrgyzstan: Vorukh (37-50 sq mi, pop. between 23,000 and 29,000, 95% Tajiks and 5% Kyrgyz, distributed among 17 villages), located 28 mile south of Isfara on the right bank of the Karafshin river, and a small settlement near the Kyrgyz railway station of Kairagach. The Valley is now divided between Uzbekistan, Kyrgyzstan and Tajikistan. In Tajikistan it is part of Soghd Province or vilayat, with the capital at Khujand. In Uzbekistan it is divided between the Namangan, Andijan and Fergana viloyati, while in Kyrgyzstan it contains parts of Batken, Jalal-abad and Osh oblasts, with Osh being the main town for the southern part of the country. Currently characterized by a high density population, the Ferghana Valley holds a very significant portion of three countries' overall population 27% of Uzbekistan, 31% of Tajikistan and 51% of the Kyrgyz Republic, with an overall population of 10 millions people (up to 250hab/km2 to be compared with the average of 14 hab/km2 in Central Asia). The Fergana valley is the most populous area in Central Asia. With these high population densities of mixed ethic groups located throughout this confined region, the result is a significant increase in competition for the dwindling natural resources left, which can lead to confrontations and even armed conflict for their control. Kyrgyzstan remains one of the poorest countries of the Former Soviet Union, and the world. The Kyrgyz economy was severely affected by the collapse of the Soviet Union and the resulting loss of its vast market. Agriculture is the largest sector of the economy accounting for 32% of GDP and more than half of all employment. Among Kyrgyzstan's mineral reserves are substantial deposits of deep-seam coal, gold, tin, uranium and other rare-earth metals. Kyrgyzstan has negligible petroleum and natural gas reserves. The economy is heavily dependent on gold exports, and changes in production levels impact dramatically upon GDP. Religion(s): Sunni Muslim 85%, Ismaili Shiites 5%, some Russian Orthodox Christians and Jews. Major Industries: Nonferrous metallurgy, mining, hydro-power, textiles, cotton, fruit. Tajikistan has a Gross National Income (per capita) of 700 US Dollars (World Bank 2009), making it the poorest of the former Soviet states. The poor state of the roads, limited external transportation links and other infrastructure weaknesses hinder development. The rationing of electricity in winter - when most of the country outside the capital receives no more than four hours (or less) of electricity a day - has serious implications for the ability of industry or IT to operate. Most of the manufacturing plants from Soviet times have been abandoned, but have not been replaced by new production. Around 75% of exports derive from a single large aluminium plant. Cotton is the most important crop, accounting for about 9% of exports. 47.2% of the population is estimated to live below the official poverty line (World Bank, 2009). The level of extreme poverty is 17.5%. The lack of job opportunities drives over a million Tajiks to seek work abroad as migrant labourers (mainly to Russia and Kazakhstan) and their remittances form a major part of the Tajik economy. Major Industries: Mining, coal and oil production, hydroelectric power. Uzbekistan has substantial natural resources, including gas, oil, gold and silver. Uzbekistan is the world's 3rd largest exporter of cotton. In the absence of substantive economic reform, the strength of the Uzbek economy is largely dependent on gold and cotton prices. Uzbekistan’s Muslim population has a secular and moderate tradition - but there is a danger that growing poverty, unemployment, combined with restrictions on political and religious freedom, could drive elements of the population towards extremism and terrorism. The majority of Central Asia is a disaster-prone area, exposed to various natural hazards such as floods, droughts, avalanches, rockslide and earthquakes. It is also now more than ever, vulnerable to man-made disasters ranging from climate change to legacy disasters related to industrial activity inherited from the Soviet period. 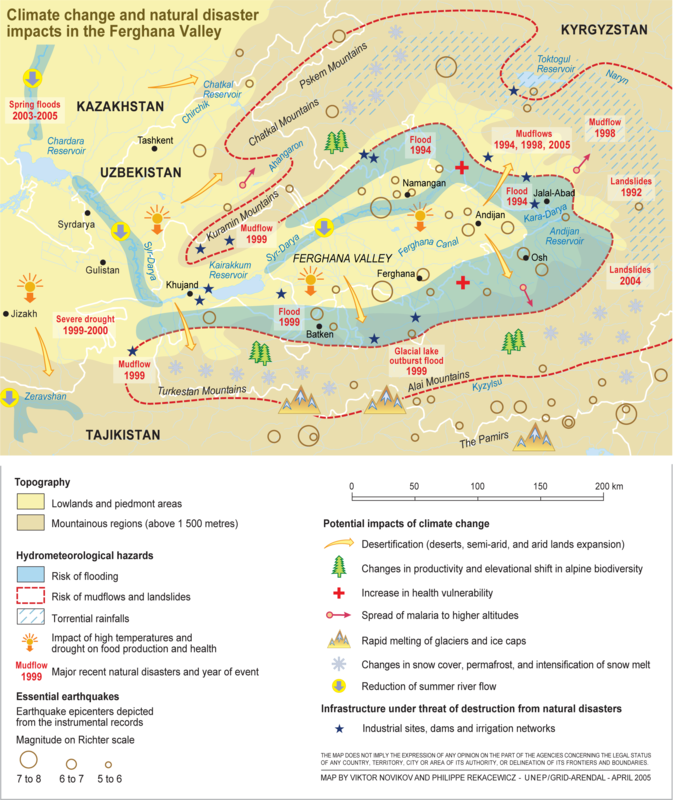 Several factors heighten the risk and impact of disasters in the Ferghana Valley region; population density, high overall population growth, wide spread poverty, over extended land and water use, failure to comply with building codes and global climate change, all which make the region particularly vulnerable to natural as well as man made disasters. Given the importance of agriculture for the whole Ferghana valley, natural resources such as land and water have historically been amongst the most important factor in this regions development. The size of the population depending upon these resources is consequently a key political security, and environmental issue. 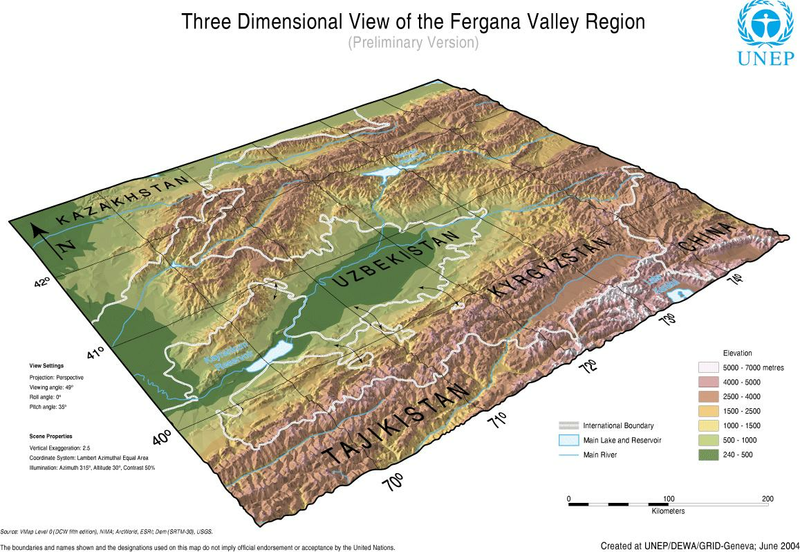 Source: "Three Dimensional View of the Fergana Valley Region." Map. Global Resource Information Database. UNEP/DEWA/GRID-Geneva, June 2004. Web. Today Fergana valley is one of the prosperous regions of Central Asia. Along the northern boundary of the valley flows the Syr Darya River, which is formed by the confluence of two smaller rivers - the Karadarya and the Naryn. Their waters feed three main canals; the Big Fergana Canal, the Southern Fergana Canal and the Northern Fergana Canal, which were some of the first nation-wide construction projects of the twentieth century. The big cities; Fergana, Kokand, Andijan and Namangan are located in the central region of the valley. In the rural area there consists mainly of cultivated landscapes, which include vast cotton fields, green spots of gardens, melon and gourd plantations and vineyards cut with lines of irrigation ditches. Rows of poplar trees and mulberry trees, plane trees and elms run along the highways running through the valley. The climate of the ecoregion is continental with high aridity. Large seasonal and daily fluctuations in temperature are characteristic. The summer is dry, cloudless, and very hot. In July, the warmest month, the average monthly temperature is 25-31 C. From June to the first half of August the maximum temperature usually reaches 40 C or more. Only in the mountains is the temperature lower. The dry, cold Siberian airmass has free access from the north where there are no mountains. The average January air temperature varies from -8 to -12 C in the northwest, -6 to -8 C in the mountains, and 0 to 2 C in the south. The Fergana valley is the most populous area in Central Asia. With these high population densities of mixed ethic groups located throughout this confined region, the result is a significant increase in competition for the dwindling natural resources left, which can lead to confrontations and even armed conflict for their control. The continual growth of these urban areas due to the lack of jobs and opportunities in the more agricultural areas has led to the continual encroachment into more farm areas, thus increasing the exodus to the urban centers. In addition, tensions between communities along the borders, especially between Tajikistan and Kyrgyzstan, over access to land, water and other resources continue to give rise to occasional violent local conflicts. The restrictions on the movement of people and goods between Uzbekistan and the other two countries severely constrain economic development and integration. Lack of cooperation between the three countries, even between Kyrgyzstan and Tajikistan, means that disaster risk management and response is weak. In addition, there are no common Early Warning Systems for the Ferghana Valley, even though a major natural disaster would probably affect all three countries at the same time. The presence of unmarked minefields on the Uzbek side of the border continues to pose a threat to communities living along the border. between Soviet republics to international state borders. This had a complex and highly significant impact, particularly on those communities living in the border zones. Borders and border posts quickly became instruments used to exert pressure on neighbors. Disputes about water or land along the border that existed even during Soviet times now became even more serious. During communist rule, conflict solutions were ordered and enforced by Moscow, however now the rule of law falls on local politicians who are often unwilling to engage in mitigation or worse, engage in manipulated the problems to serve their own interests. Blocking transit roads to achieve political concessions have taken place frequently in recent years. For communities living in the vicinity of the border, the situation is further aggravated by the fact that important and often disputed parts of the border are to date still not demarcated. The overlapping borders are notoriously porous, portals for narcotics smugglers and potential Islamic insurgents. 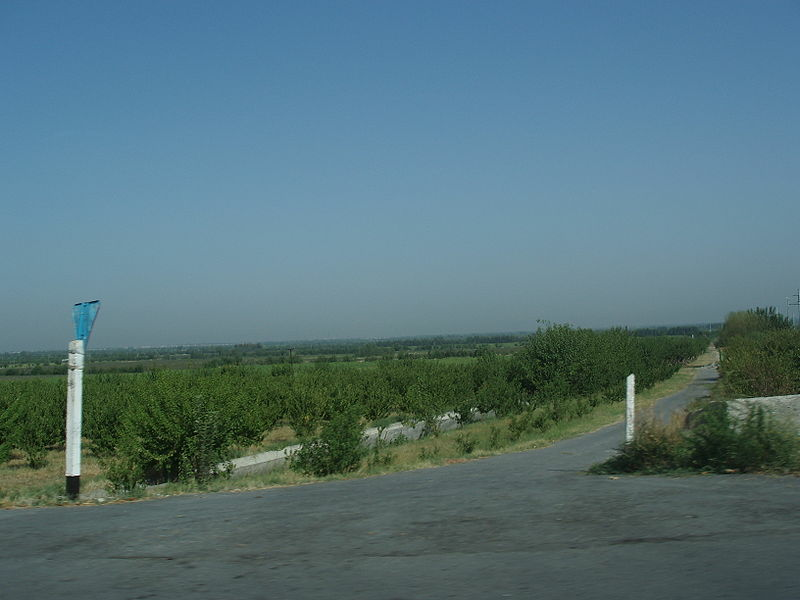 In many areas, such as around the Tajik town of Charku (South of Konibodom), the boundary is unmarked and runs through villages that are checkerboards of nationalities, with adjacent houses in different countries. Grazing rights and access to water stoke ethnic tensions, yet locals complain their respective governments who are unwilling to arbitrate disputes. 3. Conflicts arising around borders, their changed status and control regime. The first two arenas are clearly conflicts related to natural resources and the social and political organization of access to them, the third arena has only elements of resource conflict, because the border issue is partly interlaced with the land and water arenas. Some conflicts evolving around natural resources or the border regime carry the risk of “ethnicisation”, i.e. re-interpreting socio-economic problems or daily competition as inter-ethnic conflicts. 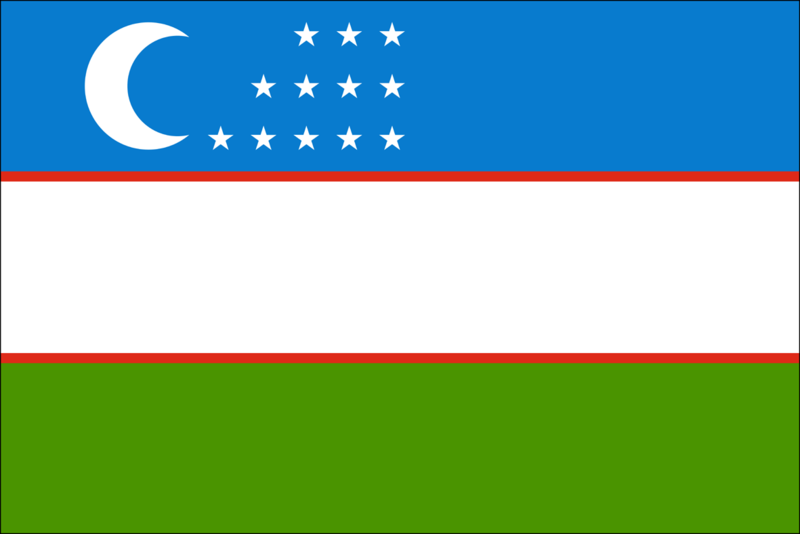 In 2005, Uzbekistan blamed radical Islamists from Osh (Kyrgyzstan) for provoking the demonstrations in Andijan (Uzbekistan) that led to intervention by the Uzbek army. Uzbekistan has long claimed that Islamist terrorists have used the enclaves and porous border as hiding places for training and launching terrorist attacks on Uzbekistan. The Uzbekistan-Kyrgyzstan barrier is a separation barrier and sporadic land mine field built by Uzbekistan along its border with Kyrgyzstan to prevent terrorist infiltration. Construction began in 1999 after bomb attacks in the Uzbek capital of Tashkent were blamed on Islamic terrorists originating from Kyrgyzstan. The fence, unilaterally erected in disputed territory has caused additional economic hardships in the poor agricultural areas of the Ferghana Valley and has separated many families in this traditionally integrated border region. At present, it has become problematic for Tajik citizens to enter Uzbekistan even with a visa. Ethnic clashes occurred in the Uzbekistan part of the valley between ethnic Uzbeks and Meskhetian Turks. Ethnic clashes also occurred in Samarkandek (on the Kyrgyzstan part of the valley) between Tajiks and Kyrgyz over land distribution and water allocation. Riots occurred between Kyrgyz and Uzbeks in Osh and Uzgen, Kyrgyzstan. Hundreds were killed. 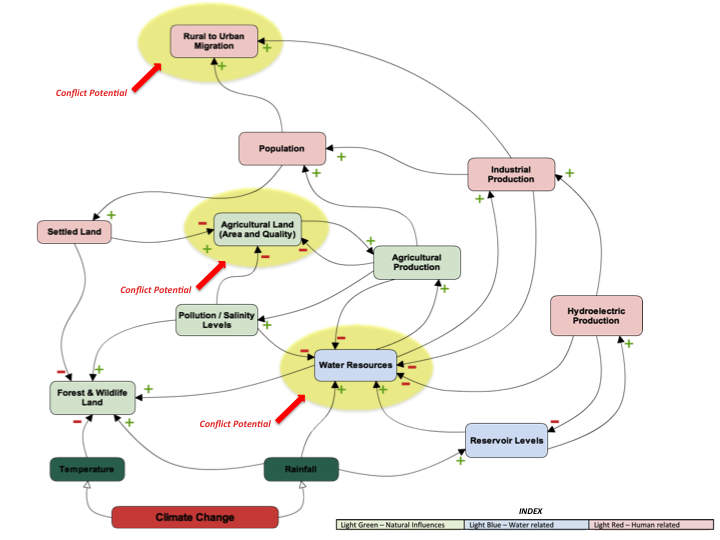 The causes of this conflict involved control over land and housing. The conflict involved a takeover of the Namangan regional administration by an unofficial militant organization called Adolat. May 1996 - Violent demonstrations were held in Khujand and (Öra-Teppa demanding the removal of unpopular local officials. April 1997 - Prison riots occurred in Khujand prison that led the deaths of a large number of prisoners. April 1997 - Tajik president Imomali Rakhmanov was injured along with seventy others in an assassination attempt in Khujand. November 1998 - Rebels led by ethnic Uzbek leader Mahmud Khudoiberdiev crossed into Leninabad from Uzbekistan, seized control of the security installations in Khujand, and occupied a regional airport in Chkalovsk. The main reason behind these events was the growing dissatisfaction by the Khujandis over the Kölabi-run government's attempts to undermine the northern region's traditional role in Tajikistan's political life. The Tajik government accused Uzbek president Islam Karimov of supporting the rebels. August 1999 - Rebels crossed from Tajikistan into the Batken district in Kyrgyzstan, kidnapped foreign nationals, and engaged in clashes with the Kyrgyz and Uzbek troops. It is now believed that the rebel group included members of the Islamic Movement of Uzbekistan (IMU), an Uzbek opposition Islamic group and former Tajik opposition fighters. February 1999 - Six car bombs targeting Uzbekistani government facilities exploded in different parts of Tashkent, Uzbekistan's capital, killing sixteen persons and wounding more than a hundred others. Uzbek official circles blamed the attacks on the IMU. Eleven people were sentenced to death and more than 120 others received long prison sentences. November 1999 - Violence also erupted over water allocation between Tajik refugees and local Kyrgyz residents in the villages of Chet-Kyzil and Bai-Karabak in the Batken province. Violent tensions occurred in Samarkandek, Kyrgyzstan, over housing and land allocation pitting Kyrgyz against Tajik villagers. In August 2000 small units of IMU rebels raided small villages over a wide area along the Uzbek, Kyrgyz, and Tajik borders. Under pressure from the international community, Tajikistan expelled the IMU militants from Tavildara in the Karategin Valley where the group had reportedly been based for several years. The militants along with their leaders were escorted to Afghanistan. Tajikistan, Kyrgyzstan and Uzbekistan are highly interdependent in terms of water and energy, making them the root cause of both international disputes and ethnic tension in the Ferghana Valley. However these two issues are also the key to peace and security in the region. The influence of the central governments of the three countries in their respective territory has been uneven and unsuccessful in some cases. 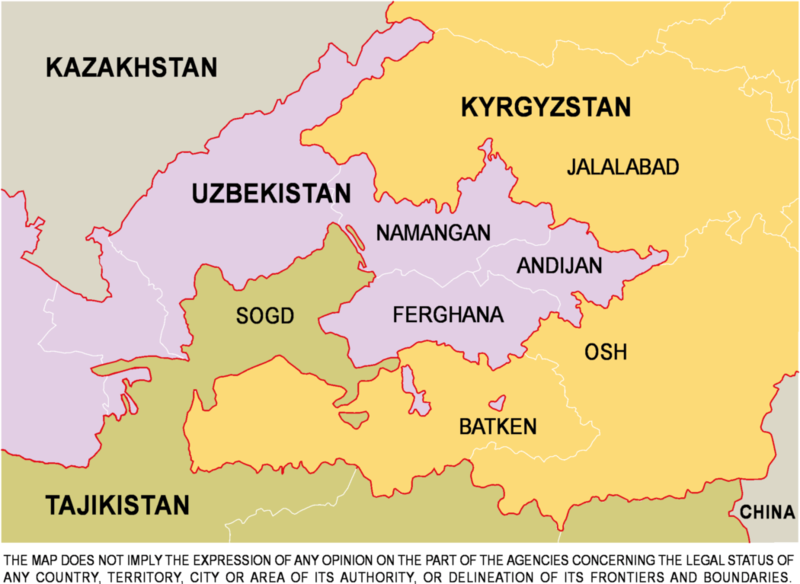 Kyrgyzstan has little influence in large areas of its territory surrounding the Ferghana Valley, allowing Islamic militant networks to grow, promoting arms and drug smuggling throughout the regions porous borders and into neighboring countries. This has sparked numerous small scale border conflicts with Uzbekistan, who by contrast has a strong authoritarian control over its territory in the valley. The lack of control by Kyrgyzstan has been a source of tension between the two countries, exacerbated by the lack of resource sharing and border disputes. While Tajikistan has a good degree of influence in its territory, the source of tension lays with both Kyrgyzstan and Uzbekistan, primarily over the delineations of the boarder and disputes over parcels of land settlements. As the borders were arbitrarily drawn and never formally agreed upon. While Uzbekistan controls most of the Valley floor, Kyrgyzstan controls the two main tributaries to the Syr-Darya River, the Naryn; Kara Darya River, who's flow is regulated by two reservoirs, Toktogol; Andijan Reservoirs and multiple dams. In addition, several smaller tributaries to both rivers and the valley, have Kyrgyz hydroelectric facilities located on them. These dams controlled by the reservoirs produce the majority of the electricity in natural resource poor Kyrgyzstan. With the increasing electricity needs and Kyrgyzstan's reliance on hydroelectric generation from the rivers, Kyrgyzstan is becoming more reluctant to drain it's reservoirs during the increasingly drier summer months, preferring to release them in the winter months to increase the river flow and thus power generation. As Kyrgyzstan is resource poor, in terms of fossil fuels, it is reliant on hydro power, otherwise it would need to buy more oil and natural gas from Uzbekistan, which it cannot afford. With the lower summer river flows on the Syr-Darya River, available water for irrigation in Tajikistan and Uzbekistan has dropped drastically, creating a serious water shortage for the extensive canal network which supports the numerous farms in the regions. The lack of irrigation impacts both the food crops output and cash crops, mainly cotton, production levels in the region. Another added strain on the ecosystem is as desperate farmers try to find more water by drilling additional wells, they further deplete the groundwater levels and increase the salinization of the soils. The Uzbek locals protest often to Kyrgyz officials, demanding that they increase water supplies to Uzbek-populated villages, sparking ethnic tensions throughout the valley. The numerous Soviet era mines and factories throughout the region are also heavily dependent on the water levels, and with the fact that larger or state owned factories usually end up getting water allotments before the farmers and smaller factories, this adds additional sources of conflicts. These factories and mines are also the main contributor to the high levels of pollution in the water, soil and air. The pollution levels and rising temperatures have also decreased the fertility of the land and the quality of life in the region. The spread of certain diseases, such a malaria and other disease vectors can be traced higher up the mountains yearly. With the lack of water or the ability to support their families and local economies, an exodus into the urban centers has begun to occur in the region. This migration has begun to put a strain on the delicate balance between the different ethnic enclaves within the region, as different groups are now coming into conflict over the same dwindling resources. High demographic pressure on limited land resources coincides with a lack of jobs and economic prospects, contributing to public discontent witnessed in many cities in the valley. The migration is further hampered by the arbitrary borders and differing visa and travel requirements.. So towns right across the border in Uzbekistan are unable to sell or ship goods to bordering towns in Tajikistan, hampering efforts to distribute resources or balance the local economies. Again stoking ethnic tensions and economic imbalance. This monopoly on the water flow of the Valley and lack of coordination has caused conflicts on both the community level and the national level, with a seriously deteriorating relationship between Kyrgyzstan/Tajikistan and Uzbekistan. 1. Gely, Johan. "Ferghana Valley: in the Middle of the Empires." Datalimiet Bereikt. SOTA Azerbaijan and Turkistan Research Center, 1999. Web. 2. Passon, Daniel, and Azamat Temirkulov. “Analysis of Peace and Conflict Potential in Batken Oblast, Kyrgystan.” Rep. Berlin: Analysis Research Consulting, 2004. ARC Berlin. Web. 3. Rekacewicz, Philippe. "Water Issues in the Ferghana Valley." Map. UNEP/GRID-Arendal Maps and Graphics Library. UNEP/GRID-Arendal, 2005. Web. 4. 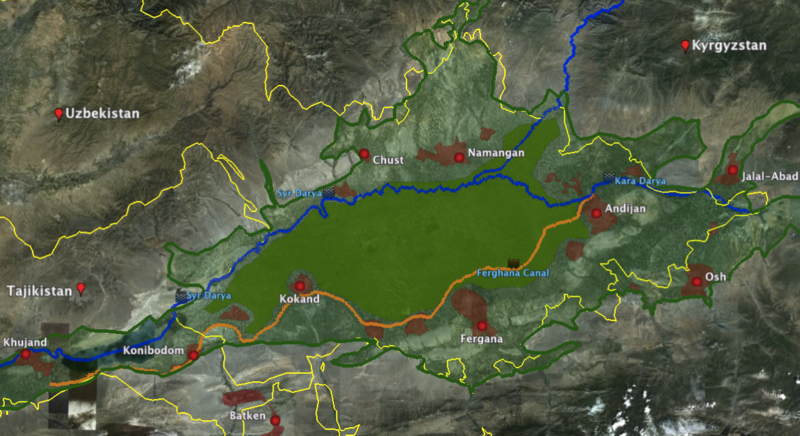 “Ferghana Valley Water Resources Management Project.” Rep. Waterwiki.net, 2005. Web. 5. Steley, Colin. “Central Asia – Regional and National Water Sector Review.” Rep. UNDP Report, 2007. Web. 6. Khamidov, Alisher. "Ferghana Valley: Harsh Winter's Legacy Stokes Ethnic Tension | EurasiaNet.org." EurasiaNet.org. June 2008. Web. 7. 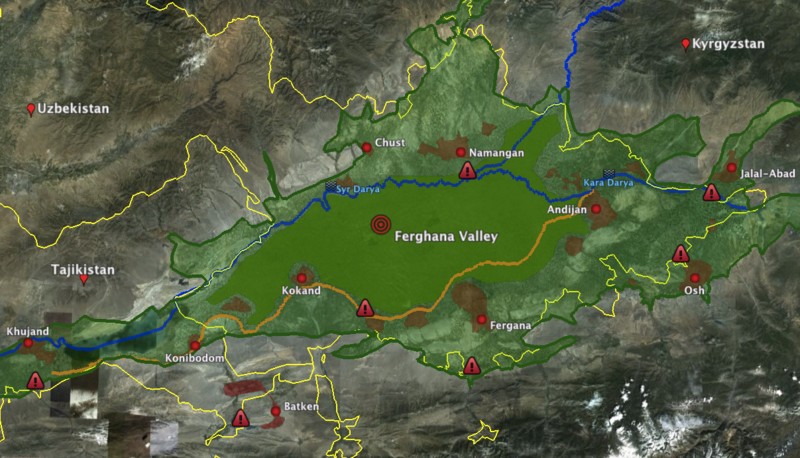 "Enclaves III: The Fergana Valley | ComingAnarchy.com." ComingAnarchy.com. 2005. Web. 8. "Country Profile: Uzbekistan." British Foreign & Commonwealth Office (FCO) Home. 9. 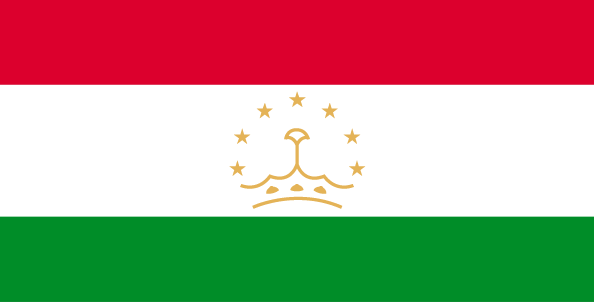 "Country Profile: Tajikistan." British Foreign & Commonwealth Office (FCO) Home. 10. William, F. "Kyrgyzstan: Strange Days on the Eurasian Frontier (2010)." COLOR REVOLUTIONS AND GEOPOLITICS. 9 Sept. 2011. Web. 11. Recknagel, Charles. "Ferghana Valley: A Tinderbox For Violence." Radio Free Europe / Radio Liberty. 17 June 2010. Web. 12. Musabaeva, Anara, and Anara Moldosheva. 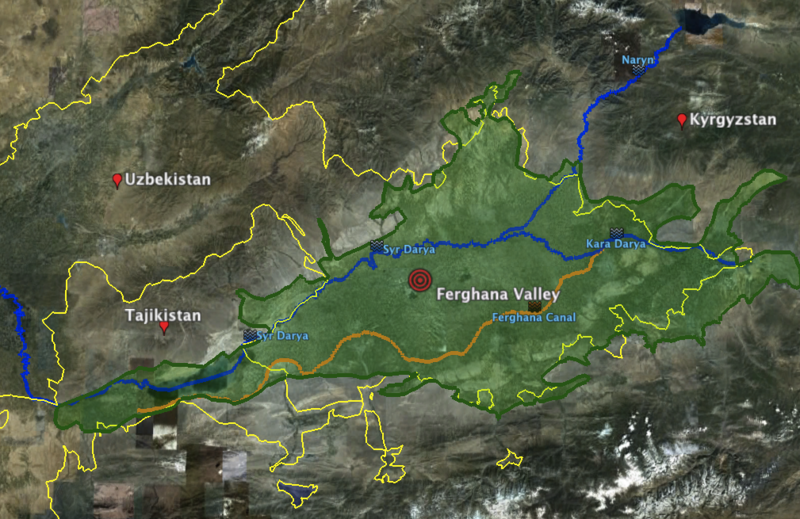 “The Ferghana Valley: Current Challenges.” Publication. Bishkek, Kyrgyzstan: UNIFEM, 2005. 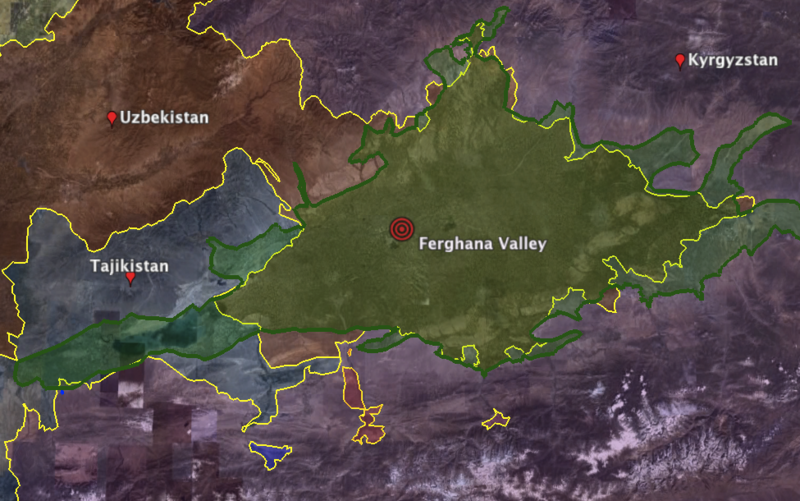 The Ferghana Valley: Current Challenges. United Nations Development Fund For Women, 2005. Web. 13. Haddad, Caroline. “A Situational Analysis of Education for Sustainable Development in the Asia-Pacific Region.” Publication. Bangkok: UNESCO Asia and Pacific Regional Bureau for Education, 2005. A Situational Analysis of Education for Sustainable Development in the Asia-Pacific Region. UNESCO. Web. 14. Frattini, B., and A. Borroni, eds. “Transboundary Risk Assessment on the Hazardous Waste Sites of Kanibadam(Tajikistan), Khaidarken (Kyrgystan), Kadamjai (Kyrgyzstan) in the Ferghana Valley.” Rep. Cortona-Dushanbe-Bishkek, 2006. Regional Synthesis Report. ENVSEC. Italian Ministry for the Environment, Land and Sea. Web. 15. Choudhury, Bipasha, Tara Denham, Aysen Kumser, and Anthony Romanelli. 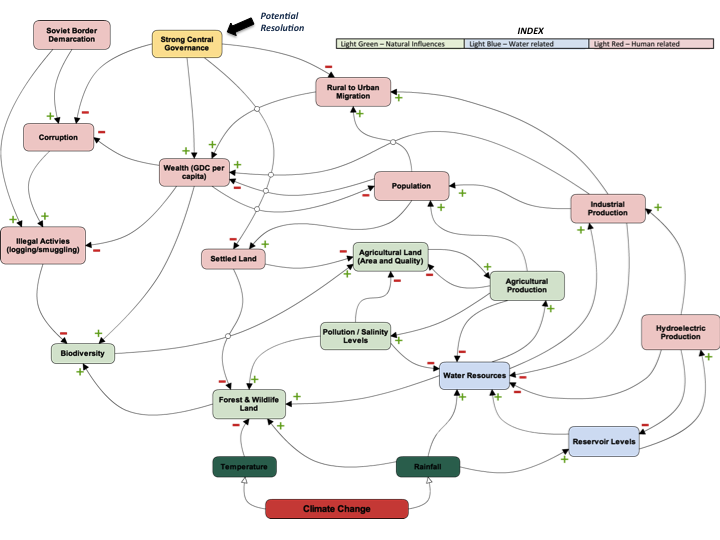 “Kyrgyzstan A Risk Assessment Brief.” Issue brief. CIFP and NPSIA, Carleton University, Oct. 2002. Web. 16. Ennis, Spencer, Sophie-Marie Lamothe, and Sean Winchester. “Tajikistan - A Risk Assessment.” Rep. CIFP and NPSIA, Carleton University, 17 Nov. 2011. Web.